I’m given many books and products to review. I’m not swimming in them, but at this point, I’ve had my share of emails from publicists and delightful packages of goodies sent my way. Yet nothing could prepare me for the email I received from Quest Books asking me to review “Politics and the Occult: The Left, the Right, and the Radically Unseen” by Gary Lachman. That’s right music fans, Gary Lachman, also known as Gary Valentine, bassist for the to die for band Blondie. What was this emotion I was experiencing? Could it be giddiness? Yes, I’m embarrassed to say, I was “as happy as a school girl”. It took awhile to get into the book. Not because it wasn’t engaging, but because I kept sitting there thinking to myself, I’m one person removed from Gary Valentine! How cool am I? Once I finally pushed past the girlish giggles and congratulatory pats on my back, I came to a startling and delightful realization. Lachman has got game. (For the record, I have very little game, just enough to recognize the fact that Lachman has it.) 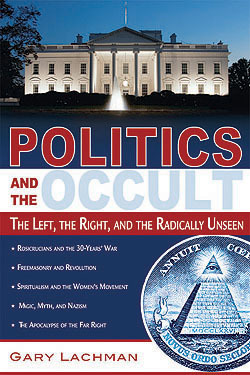 “Politics and the Occult” isn’t pop culture fluff, and it’s not a rehashing of the ever popular Hitler and the occult genre, it’s a fascinating, thoroughly researched, and entertainingly presented look at the subtle influence that occult movements have on societies. What’s left, you may be asking? Lots. A few favorites of mine were the discussion of the link between spiritualism and the women’s rights movement that includes an introduction to Victoria Woodhull, an interesting section about Jung culminating with the his time as “Agent 488” helping the Office of Strategic Services by making psychological assessments of Nazi leaders, and a mind blowing look at the occult movements at work during the French Revolution. Personally, I plan on reading this book again. This time with a notebook and pen at my side to make note of all the people I want to learn more about and the many books that I’m now chomping at the bit to read. Add to that I now feel compelled to read all the other books Lachman has written that I just learned about, and well, I’m never going to have time to read all those “Hellblazer” comics that are sitting by my sofa.